The Dragon Whisperer is back! Agent Green sets up her DCHQ* Field Station in the shade of the Adventure Playground and welcomes all ages with Dragon Tales plus hot tips on the care and maintenance of dragons. 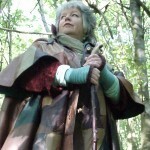 New storytelling persona Nightshade the Wise Woman of the Woods tells spinetingling tales of forest and jungle, Secret Tales of Britain and much more! * Welcome aboard your very own magic carpet ride around a world of thrilling traditional tales. Featuring the Carpet of Dreams story from Herat, Afghanistan, plus twisty yarns about all kinds of craftiness! Second half: SCHEHERAZADE’S SHED – contemporary story cabaret for adults. Doomed highwaymen, terrifying trees and the dramatic Legend of the Rollright Stones circle served with coffee/tea and delicious home made cake. Enjoy a civilised Sunday afternoon discovering the story heritage of the Cotswolds and all the Isles of Britain. Includes mild horror and adult references. 2.15pm Dragon Tales to Start Art: Exciting adventure stories about dragons from around the world. Then do the pictures! Come and meet the world’s only living Dragon Whisperer as she schools the new Hatchling around Sudeley’s beautiful gardens and grounds. Suitable for age 7+ and fantasy fans of all ages. Fantasy meets science fiction as Agent Green tells stories and shares rare knowledge of dragon behavoiur. For age 7+ and fantasy fans of all ages. 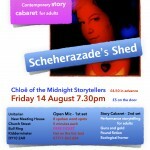 – Chloë of the Midnight Storytellers blows away any notion that storytelling is just for kiddies! In her glorious Sparkle Coat, Agent Green ends the summer holidays in enchanting style. For children 8+ and fantasy fans of all ages. As above – Agent Green and her dragon companion fly further afield! Chloë joins an international line-up of experts, authors, artists, performers and musicians – celebrating The Hobbit’s 75th birthday, living and breathing the world of J R R Tolkien. – SUNDAY 19th Tales from Tolkien, a Creative Experiment. Serious fun with the creative genius of JRRT. The challenge is to lift Tolkien’s stories off the page and return them to the oral tradition. The world’s only living Dragon Whisperer rounds off her special series of shows for ‘Story Lab’, the 2012 Summer Reading Challenge for children. 29 July – 12 August: Stories for every port of call, aboard Fred Olsen cruise liner Braemar en route to and around the Canary Islands. Five different performances.. One workshop for 200..! Meet ‘Agent Green’, alleged Draconics Expert from DCHQ – from a department so secret that even they don’t know she exists! 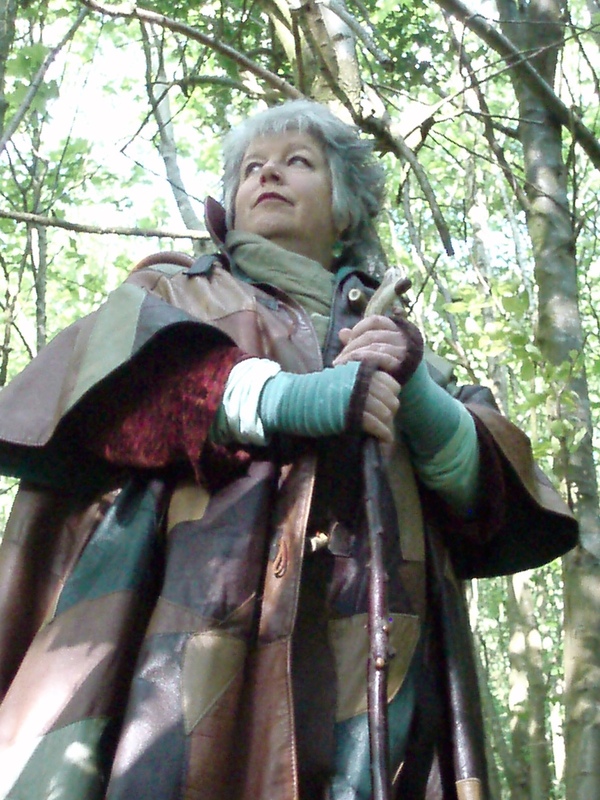 In her leather dragonproof cloak, ‘Ms Green’ reveals the secrets of surviving first contact with a wild dragon, plus stabling, feeding + veterinary care. Powerful tales of forest + wilderness. Ravening beasts, horrible hags and trees marching to war. Suitable for adults and bold children. The acclaimed festival welcomes Chloë’s witty, feelgood Story Cabaret for adults. Deliciously naughty tales for 15+ only. Stand up meets storytelling – in Wimborne Council Chamber! One hour introduction to the fun and skill of storytelling, for teens and adults. Chloë’s innovative show wraps eerie sound effects around traditional tales plus modern and original stories. Age 12+. 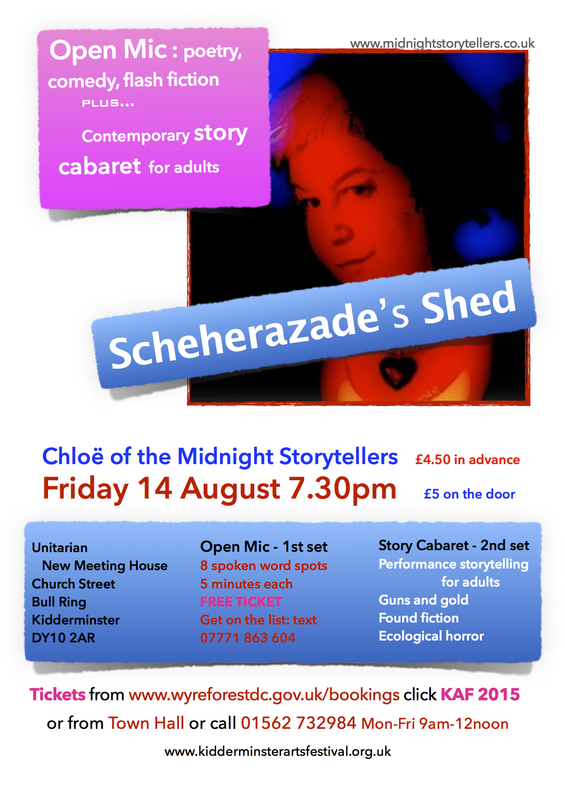 Story cabaret pioneer Chloë of the Midnight Storytellers performs some of her strangest tales, designed to spellbind an adult audience.